Doctor: “We’ll talk about that when you get your cast off.” He glanced at my husband, looking for support. Yep. That went especially well. Surgery, on the other hand, actually did go well, and we arrived home shortly after noon. The pain killers were doing their thing, and the ice packs were doing their thing. And I did my thing. I kept my arm elevated and resting on a pillow. Everything just as the doctor ordered. Best patient ever! I drifted in and out of a drug induced sleep the rest of the day. Despite the lack of sleep, I awoke Saturday morning ready to conquer doing everything with my left hand and embark on my path to healing. First on the agenda: ditch the painkillers. Because I am tough, and I don’t need painkillers. As I’m sure you can guess, that was an incredibly bad idea. I was in so much pain by noon that all I could do was lay in the chair and cry. I couldn’t even curl up in fetal position because of my arm. And with that realization came more tears. At this point, the husband took charge and “encouraged” me to take the painkillers. (In other words, he brought them to me with a glass of water and told me to take them.) I did. Monday morning I was on my own, as my husband went back to work. And me? Well, I was not able to go to work. So, for a lack of anything more constructive to do, I created my new workout plan: squats, lunges, abs, and arm. Notice no “s”. Arm. At night, I would go for a walk with my husband under the cover of darkness. Typically we would cover about 4 miles. Weekends allowed for longer walks. This was the routine until my return visit to the doctor, about 3 weeks later. At this point, my soft cast was removed. I was left with gauze pads, an Ace bandage, and a sling. 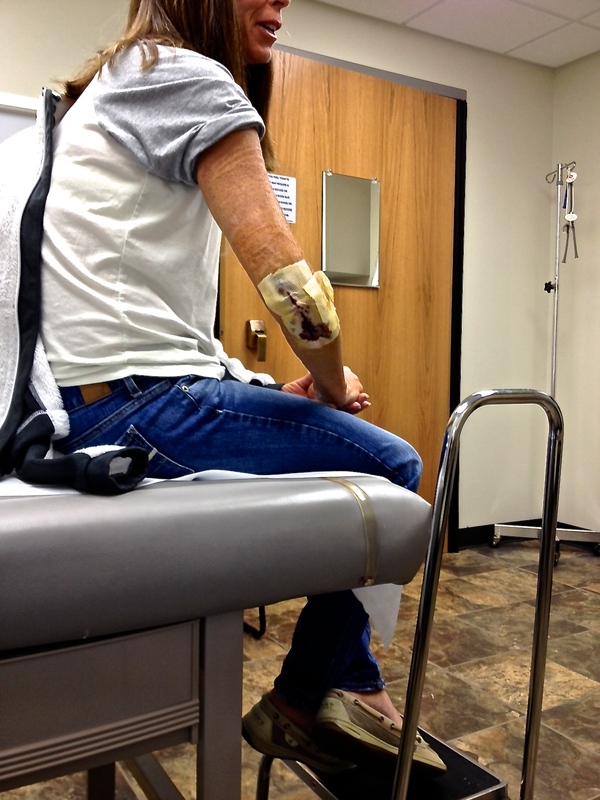 This is what an arm looks like after being in a cast for 3 weeks…a little shrively. On the bright side…I was cleared to return to school earlier than planned AND I was cleared to ride the bike at the Y! The old person bike at the Y. You know, the one that feels like you are sitting in a chair instead of riding a bike. Funny thing? I didn’t even care! Fast forward to Saturday morning. I was filled with excitement (as well as high expectations) as we walked into the Y. I had my whole workout planned. After shedding my sweats and hanging them in a locker, I headed for a bike, adjusted the seat, and programmed my workout: 60 minutes, hills, level 12. Rather ambitious, I know. About half way into my ride, I felt like I was pedaling with flat tires. Through mud. And uphill. So I backed off to level 10. I tried (unsuccessfully) to finish strong by returning to a level 12. That lasted for maybe a minute. I accepted the fact that I was going to limp across the finish line. Fine. Whatever. I got off the bike, feeling “a bit” lightheaded, and very, very sweaty. And like any intelligent human being, who hasn’t had any strenuous exercise in the previous month, I headed to the weight room. I did make a compromise with myself, however. I was only going to do one set (as long as I was maxing out before 12 reps). Squats, lunges, flies, bent over rows, and bicep curls. Lighter weight for my right arm—‘cuz that was the SMART thing to do. I plugged along feeling less than wonderful. But, I did it! As headed out of the weight room to grab a mat and do some abs, I started seeing stars, and then everything went black. Then I felt my heart go into overdrive. I have a history of PAT (paroxysmal atrial tachycardia)-another story for a different time. I grabbed for the wall, and started to panic. I did NOT want to pass out in public. And then suddenly, I heard my husband’s voice, and felt him grab hold of me. Fortunately, he had been keeping an eye on me. And he was not happy. Nope, he was not happy at all. He walked me out to the track area, and I laid down on a mat. And didn’t move. Not the ending I had planned. Yep, just another fine example of what happens when you don’t listen to your body. Stay tuned for part 3, the final segment, where you will finally hear about my relationship with the treadmill, and more importantly you will understand why I have become a lot more intelligent about exercising.